Features 160-LED lights for optimum illumination and diffuser. Rotate switch for on/ off and brightness stepless adjustment. One touch battery check with 4 level indicator: press the test button, 4-LED On means battery full, 1-LED On means battery low. Multiple Power Options (not included): Panasonic CGR-D16S; Panasonic D series (D08S, D16S, D28S, D54S); Sony NP-FH70, NP-FM55H, NP-F550; Sony FP series (FP50, FP70, FP90); FM series (FM50, FM55H, FM500H, QM71D, QM91D); F series (F550, F570, F770, F960, F970); FV series (FV50, FV70, FV90); FH series (FH50, FH60, FH70, FH90, FH100) rechargeable battery and 6 * AA Battery. 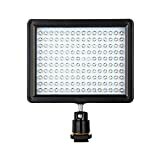 Use: Insert hot shoe of LED video light on base of hot shoe of camera or camcorder, turn on the LED video lighting, then you can start picture or video taking. Attention: Battery holder adapter (Not included) is required when use Panasonic series batteries for power supply. This entry was posted in Discount Photography and tagged 1280LM, Andoer®, Camcorder, Camera, Canon, Dimmable, DSLR, Lamp, Light, Nikon, Panel, Pentax, Plug, Shoe, Standard, Video by Ball Photo. Bookmark the permalink.